An exquisite, ultimately stunning film about a young life uprooted by war, Hollow City—Na cidade vazia is the Portuguese title—is the first feature by Maria João Ganga, who was born in Angola and who studied film in Paris. It comes from Angola and Portugal, and is set in 1991, during the Angolan civil war. N’dala’s family is slaughtered in rural Bié. The 12-year-old boy, along with other children, is airlifted by the Red Cross to Luanda, Angola’s capital city. However, N’dala eludes the nun in charge of the group and goes off on his own, misled by her religious twaddle into believing that his parents still exist “in the sky” back in Bié. Like E.T., little N’dala wants to go home. Ganga, reputedly the first Angolan woman filmmaker, deservedly won for Hollow City the Special Jury Prize at the 2004 Paris Film Festival. Let me say at the outset that Ganga’s script, based on a novel by Artur Carlos Maurício Pestana dos Santos, is not among the film’s assets. The occasional shifts away from N’dala, who is beautifully portrayed by Roldan Pinto João (perhaps the filmmaker’s nephew or younger brother), in order to follow the nun’s dogged (and unlikely) search to recover the boy, are irritating, and the numerous attempts to force a parallel between N’dala and a national hero being played in a school play by a slightly older boy, Zé, who befriends the homeless orphan, fail to convince. These are distractions, as is the academic irony that the script pursues, to wit, that Luanda proves to be as unsafe for N’dala as was Bié. Rather, the film’s genuine worth lies in two things. One is its visual design and procedure, its series of highly defined shots rather than narrative scenes—this, correlative to N’dala’s profound impressions and lightning-quick perceptions. The other is the richness of the boy’s solitary wanderings as they intersect with a number of characters who befriend him, including Antonio, a poor, protective, elderly fisherman who refreshes his recollection of home. Another, younger man, Zé’s relation, both kindly helps N’dala, especially in perfecting the craft of his ingenious toy cars made from wire and scrap metal, and later exploits him, involving him in a lethal house theft. N’dala’s innocence is both his strength and his vulnerability. 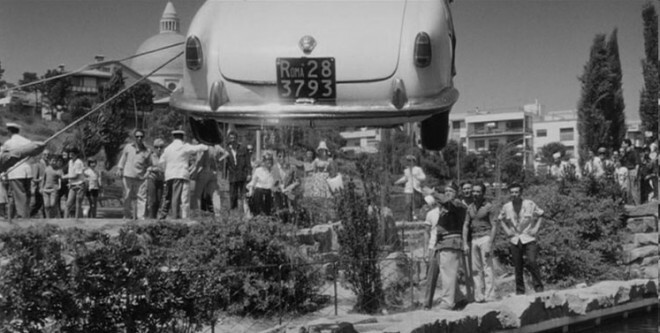 In effect, Hollow City is a road film—like Roberto Rossellini’s tremendous Francesco, giullare di Dio (1950), a road film by foot. This includes an hypnotic portrait of the half-world of night prostitution. (One of Zé’s cousins is a prostitute.) N’dala’s journey introduces him to a wealth of urban experiences that fill him with wonder but nonetheless sharpen his yearning to go home. One thing more: the cinematography by Jacques Besse helps make Hollow City. Cinema’s color experiment has, artistically, fallen flat in the main; but Ganga’s film, especially at night, justifies the use of color to a rare and highly expressive degree.